If positivity had a face, it would feature the Kapoor scion and Neetu Kapoor would back our claim, given her latest Instagram post reflecting the same. 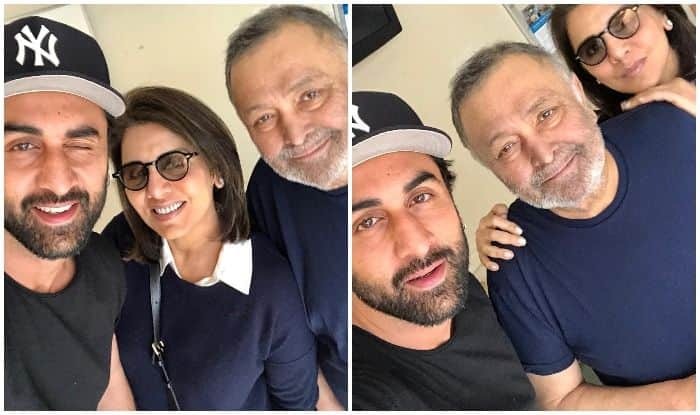 As Brahmastra star Ranbir Kapoor squeezed out time for his family from the busy shooting schedule and headed to the States to meet his parents, Neetu posted happy pictures from the meet where even Rishi Kapoor, who is undergoing treatment there, looked all glowing. In the shared pictures, Ranbir can be seen dressed in a black tee and cap while his parents twinned in navy blue. Ranbir’s happy wink in one picture stole his mother’s heart who then captioned the post as, “That amazing feeling in your lows when there is Positivity Happiness Love and that Wink!!! !” (sic). That amazing feeling in your lows when there is Positivity Happiness Love 殺 and that Wink !!!! Not losing any time, Ranbir’s co-star Alia Bhatt and her mother posted heart emojis on the posts. Adding to the family PDA, Ranbir’s sister Riddhima, who was missing from the pics, too commented on the post with heart emojis. Within a few hours, the post garnered over 70k likes and is still counting. Ranbir Kapoor was recently awarded the Best Actor Award at the Zee Cine Award for his performance in Sanju. While receiving the award the actor got emotional and dedicated his award to his father Rishi Kapoor who is undergoing treatment in the US. Ranbir revealed that his father is insecure about being able to work post returning from his treatment. On the professional front, Ranbir will soon be seen in Ayan Mukerji’s Brahmastra with his rumoured girlfriend Alia Bhatt. Though Alia has denied dating Ranbir, their too romantic-to-handle videos from the award show are doing the rounds which made fans believe that the actors are head over heels for each other.